KR-415FHD achieves a highly precise receiving performance with the use of a dual circuit and an external and internal antenna. This is 5.5 mm thiner than previous models, so the car gravity is lower, and you can easy installation to the Radio box on the car. Antenna length is 210mm. It fits into the body of the electric touring car clearly. The HCS mode shortens the communication time of the signal which has been compressed. 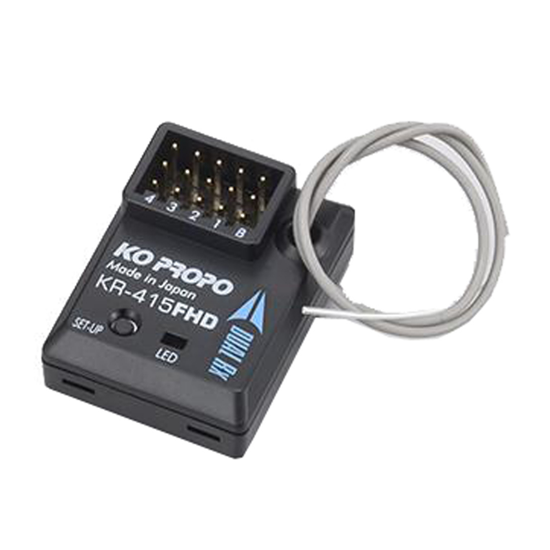 KR-415FHD can change a mode to each channel 1-4 indiviually. HCS is a communication method to largely improve linearity of the servo movement. When using HCS mode, correspondence servos(ex, RSx3/BSx3series)are required. The correspondence servo recognizes both modes automatically.